Its program empowers new moms to live heart-healthy while raising awareness of congenital heart defects. Through the Little Hats, Big Hearts program, the American Heart Association is raising awareness about family heart health and congenital heart defects, the most common type of birth defect in the country, with support from The Children’s Heart Foundation. This effort aims to empower new moms to take charge of their own wellbeing while starting a healthy lifestyle for the entire family. This year, 27 New Jersey hospitals participated in the Little Hats, Big Hearts program. Of those, 12 Central and South Jersey hospitals participated including Cape Regional Medical Center, Community Medical Center, Inspira Medical Center Elmer, Inspira Medical Center Woodbury, Inspira Medical Center Vineland, Jersey Shore University Medical Center, JFK Medical Center, Monmouth Medical Center, Riverview Medical Center, Robert Wood Johnson University Hospital New Brunswick, Robert Wood Johnson University Hospital Somerset and Virtua Medical Center. 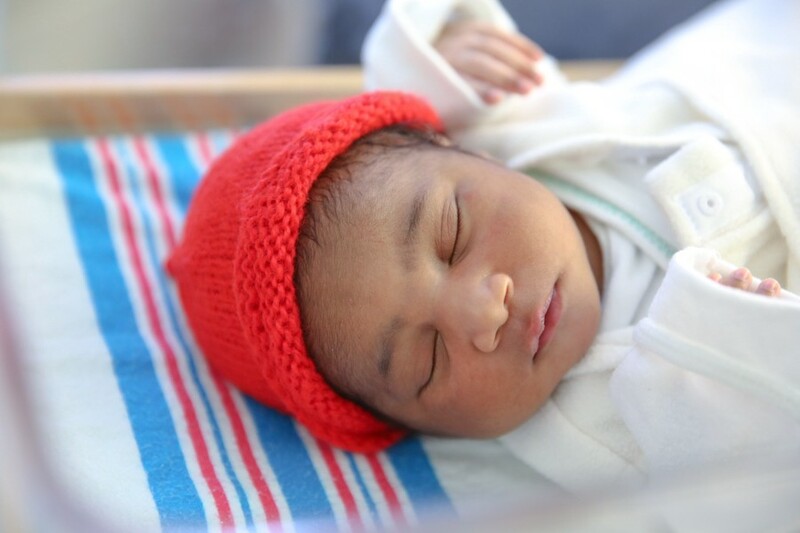 Parents received a handmade, knitted or crocheted, red hat, as well as a kit full of heart-healthy information for mom and baby. Each mom received a health packet which included tips on raising healthy children, workouts to do at home and an American Heart Association recipe, as well as information on congenital heart defects. “I was so excited to see the volume of handmade knitted red hats the American Heart Association received this year. As a stroke survivor, it is important to me that others understand the importance of raising heart healthy families,” Aimee Minarich, Little Hats, Big Hearts volunteer and survivor ambassador for the American Heart Association and American Stroke Association, said. Each hospital distributed nearly 100 kits during Congenital Heart Defect Awareness Week, starting on Tuesday, February 7. Congenital heart defects are structural problems with the heart present at birth. They result when a mishap occurs during heart development soon after conception and often before the mother is aware that she is pregnant. Defects range in severity from simple problems, such as “holes” between chambers of the heart, to very severe malformations, such as complete absence of one or more chambers or valves. According to the American Heart Association, it’s possible to fix most congenital heart defects and there are an estimated 2 million CHD survivors in the United States. The Little Hats, Big Hearts program started in Chicago in 2014 and has expanded to more than 40 states. Over 2,000 kits are being distributed throughout the Garden State. Other participating New Jersey hospitals include: Chilton Medical Center, Clara Maass Medical Center, Hackensack Meridian Health, Jersey City Medical Center, Morristown Medical Center, Newark Beth Israel Medical Center, Newton Medical Center, Overlook Medical Center, Saint Barnabas Medical Center, St. Joseph’s Regional Medical Center, St. Mary’s Medical Center, Trinitas Regional Medical Center and Valley Hospital. For more information about the Little Hats, Big Heart program in New Jersey, please visit: www.heart.org/littlehatsbighearts.